Kurt Lewin famously once said that “there’s nothing as practical as a good theory”. My experience has been the other way round: I’ve spent my career discovering practical ways to make things more meaningful, then tried to figure out what the theory was that explained why it worked. I picked up early on that the single key to the whole thing was learning to connect with the experience of the audience, by reducing the level of abstraction of the content through various means. But I didn’t have a good theory as to why. Over the years different pieces have fallen into place, until I now feel I have a pretty robust model that accounts for most of the things I’m interested in. At some point I’ll put this all together into a book, but in the meantime here’s a very succinct outline of the basic ideas. This is background for those interested in where I’m coming from, so I haven’t gone to great lengths at this stage to make it accessible, so proceed at your own risk! That said, you certainly shouldn’t need to understand any of what follows to get value from the articles and posts. They are all predicated on the model, but they don’t assume any prior knowledge of it. What do we mean by “meaning”? Most languages have a word like “meaning”, a word which has two senses – one that conveys understanding (“I see what this means“) and the other that conveys significance (“this means a lot to me”). The simplest definition of meaning draws the two senses together – it is the feeling of “I get it” and “I care”. Well, if you think of the challenge facing the brain, it has to somehow make sense of a vast and continual flow of sensory data that it just doesn’t have the bandwidth to cope with. So it works by building a model of the world as it is experienced. It then uses that model to filter subsequent experiences, only expending energy on things that stand out as worthy of attention. The extent to which you can survive and flourish in the world is dependent on the level of sophistication and accuracy of your mental model. Babies can’t survive alone because most of their model hasn’t been built yet. Adults (and groups of adults, like couples, families, project teams, work organisations) survive and thrive because their respective models are – to some degree – in tune with reality. We destroy shared meaning by becoming overly attached to our own models of the world and using them to attack other people’s. We create shared meaning by communicating in a way that connects with shared experiences. Why is shared meaning so important? Meaning unlocks energy. The more we care about things the more we want to understand them, and the more we understand them the more we care about them. So to create shared energy in a group of people we need to create shared meaning, which you can do by communicating in a way that connects with the shared experiences of the people in the group. How is shared meaning created and destroyed? On an individual level, meaning is created whenever we encounter something in the world that either does or could signify something significant (i.e. “I get it and I care”). What makes us distinctly human is our ability to generate this meaning for ourselves and other people using symbols – words, pictures, diagrams, gestures, facial expressions, iconography etc. etc. I define “symbol” broadly here to mean anything that can be used to “stand for” anything else, and we can and do use pretty much anything for this purpose. Isn’t a lot of this just what good communicators have known all along? Doesn’t any good communicator already know to check the audience and outcomes first, explain things simply and clearly, apply good design principles, test solutions on trial audiences first etc. etc.? Indeed. But it seems to me that most practical guides to communication are derived from observations about what works, but lack a compelling underlying theory as to why it works. Our favourite book on communication (and the one we tend to recommend most often to people) – the Heath brothers’ Made to Stick – is a great example of this: Six great principles that really work, but no underlying theory as to why they work the way they do. Our hope is that by exploring at a deeper level how mental models are constructed, and using insights from emerging disciplines like cognitive linguistics, we can together learn how to represent much more complex ideas in much more meaningful ways to much larger numbers of people. The content of a symbol will be a combination of “substance” and “identity”. Remember that meaning is a dynamic process – your brain finds things meaningful when they tell it something useful about about you-in-relation-to-the-world. But the world shows up in two different ways – as physical stuff (you are a body that takes up physical space in a physical world) and as intangible identity (you are a person with an intangible sense of self, surrounded by other people with whom you are in relationship). I talk about this dimension more here. The impact of a symbol will be a combination of “signification” and “significance”. This is what meaning feels like. Remember that the whole reason your brain uses a model of the world is to conserve processing power, so it will pay attention to things that (a) are intelligible (i.e. signify something that already exists in your current mental model), and (b) are important. I talk about this dimension more here. If you put these two dimensions together, you end up with a visual description of how meaning is experienced by an individual. Notice how different this is to most existing models of meaning. It does not focus on what is true, or how to figure out what a symbol denotes in the “real world”. It assumes that meaning is a dynamic process that will be different for every individual. Why might this be useful? Although it’s an experimental model at the moment, it’s already an interesting way of exploring where shared meaning might lie. Here are some simple examples. Firstly a Haynes mechanical manual for a classic car – which will mean very different things depending on whether you are a mechanic repairing it (top left), an owner looking after it (bottom right), or both (whole circle!) 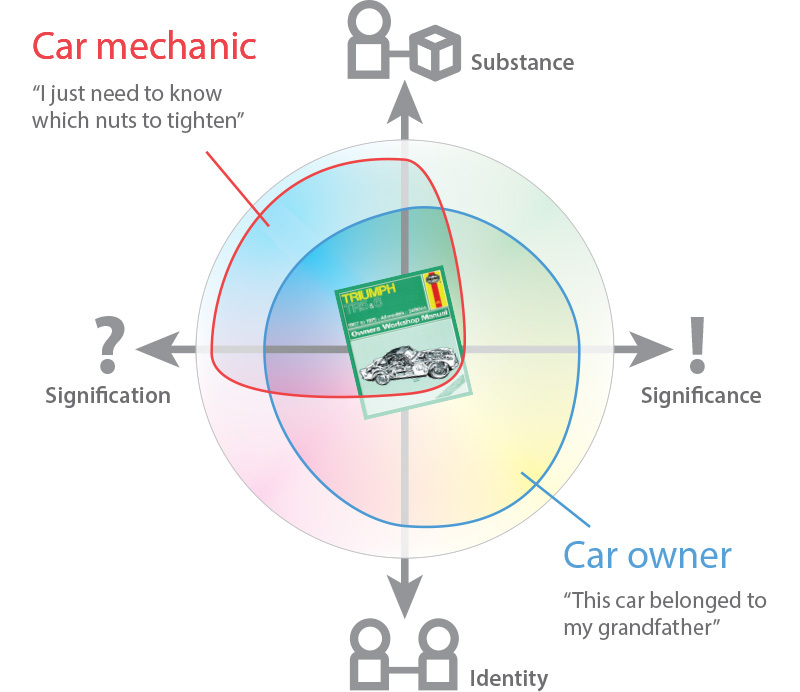 The overlapping space shows the area of shared meaning, which is where the owner and the mechanic are likely to have the most meaningful conversations. Secondly here’s a work example that we’re all too familiar with. The vision and strategy of a company are written down in a document that is circulated around the business. What does this document mean? From the CEO’s perspective (assuming that they understand to a reasonable degree what it means – not always the case! ), it not only signifies what needs to be done (the allocation of resources – substance), but also has huge significance because so much of the CEO’s ego (identity) rests on the success of the enterprise, and therefore the validity of the document. By contrast, a lower level employee has a much more limited perspective than the CEO, and will often find that the document is written largely in management-speak. Consequently it signifies very little substantive meaning. What is extremely significant to the employee is whether or not they still have a role – will their skills still be valued given the new vision (identity)? Again, the overlapping area shows where the most meaningful conversations are likely to lie.